And that’s all before Meyers dropped the late-breaking bombshell that former FBI head (and longtime Comey ally) Robert Mueller has been chosen by Deputy Attorney General Rod Rosenstein as special counsel for the Department of Justice, specifically to investigate all Russian interference in the 2016 presidential election (and all that other stuff Meyers ran down earlier). 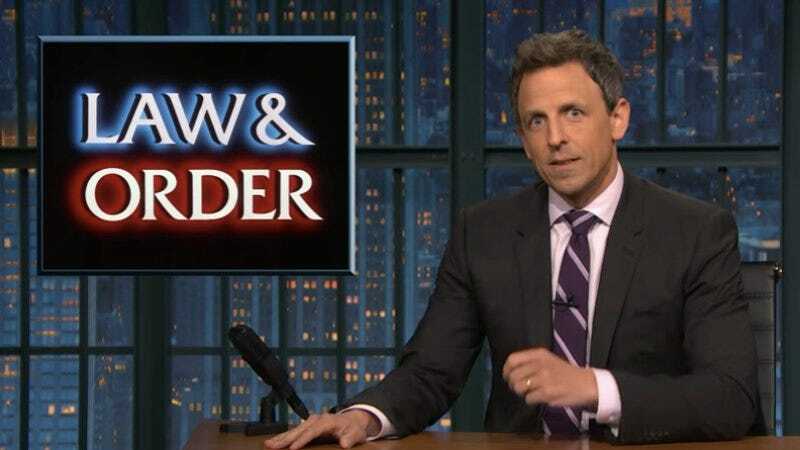 Saying that the Mueller announcement came just minutes before Late Night was set to tape, Meyers compared the increasingly rapid pace of these incredibly damning revelations to an episode of Law & Order. Playing a clip of Trey Gowdy (one of the only Republicans willing to speak at all about the day’s political Trump-storm) complaining that all these carefully sourced, meticulously researched news stories don’t constitute guilty verdicts, Meyers explained, “People don’t tune in just to watch the end of Law & Order.” As Meyer put it, there are a lot more [Law & Order sound]s on the way.